The Republic of Crimea has addressed the UN seeking recognition as a sovereign state and called on Russia to integrate it into the Russian Federation. 96.77 percent of the Crimean population voted ‘for’ the integration in a referendum. "The Republic of Crimea intends to build its relations with other states on the basis of equality, peace, mutual neighborly cooperation, and other generally agreed principles of political, economic and cultural cooperation between states," the legislation says. Crimea was declared an independent sovereign state, the Republic of Crimea, on Monday, the autonomous Ukrainian regional parliament's website stated. The Supreme Council of Crimea unanimously voted to integrate of the region into Russia. “Those who, according to their beliefs, don't accept the Crimean independence and stay true to the Ukrainian state won't be persecuted," the head of Crimea's parliament Vladimir Konstantinov said, as quoted by ITAR-TASS. He added that the same principle will apply to government employees and security workers who took the oath of allegiance to Ukraine. Meanwhile, Ukraine’s coup-imposed President Aleksandr Turchinov called the referendum “a great farce,” saying it will never be recognized either by Ukraine or by the civilized world," AFP reported. It's after the announcement of the official results: 96.77 percent of the Crimean population has voted ‘for’ integration of the region into the Russian Federation. The turnout was 83.1 per cent. The referendum saw a massive turnout, with 81.3 percent of the eligible voting population participating, the head of the Crimean parliament’s commission on the referendum, Mikhail Malyshev, said. There were 1,233,002 votes ‘for’ integration, with the total number of those who voted standing at 1,274,096 people. The referendum commission has not received any complaints, Malyshev stressed. 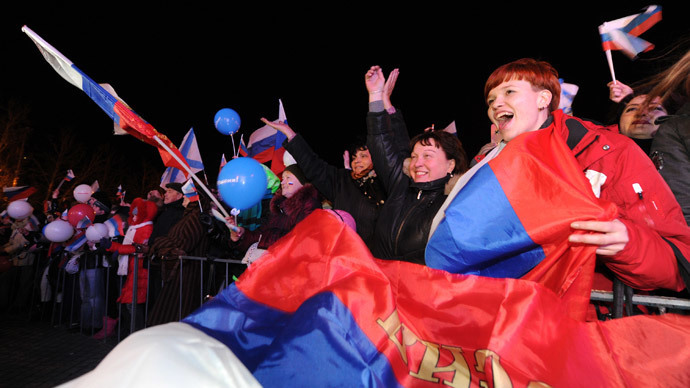 On Sunday evening, in Simferopol, the capital of the republic, at least 15,000 people have gathered to celebrate the referendum’s results in the central Lenin square, waving Russian and Crimean flags. Next week, Crimea will officially introduce the ruble as a second official currency along with Ukrainian hryvna, Crimea's Prime Minister Sergey Aksyonov told Interfax. The dual currency is to be established in about six months. Overall, the republic’s integration into Russia will take up to a year, the premier said. However, it wants to maintain relations with “economic entities, including Ukraine,” rather than burn bridges.